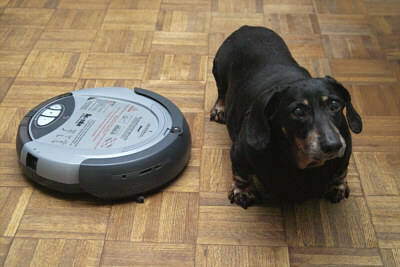 A Rumba with the Roomba or Can Pets and Robots Get Along? What is Roomba? For those who haven't heard about the Roomba, it is a 1 foot diameter, circular-shaped robot that vacuums your house for you. Being a science fiction fan since I was a child, I've always wondered when robots would become a household reality. Personal computers are way beyond where most 50's and 60's science fiction predicted, but robot development is far behind those same predictions. We were all supposed to have talking robotic butlers by the year 2000. 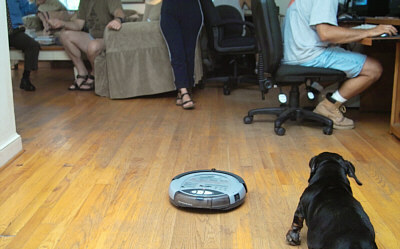 Roomba is a far cry from those imaginary home androids, but it's a darn good start. The Robot: Roomba is small, perhaps 1 foot across and 2 inches high. 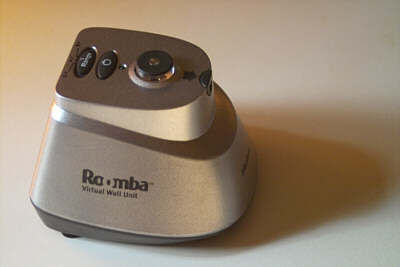 It has a front bumper that acts as a wall detector, a front infrared detector that works with the "virtual wall unit" (discussed below), and an edge detector on the right side that senses edges and allows Roomba to follow a wall or other object. It also has a front mounted stair detector that prevents Roomba from falling down a flight of stairs. Underneath are 2 good sized wheels, and a roller brush. There is a spinning set of small brushes that stick out the front right side, which act to pull dust from edges toward the main rollers. There are 3 buttons on top, for designating what size room you want it to clean (small medium and large). This just sets how long Roomba will clean a room before shutting down automatically. There is a folding handle on top that lets you grab and stop Roomba in it's tracks. The rechargeable battery lasts between 60 and 90 minutes per charge, enough for 2 or 3 large rooms. Roomba is designed for hard floors and carpets. However, it doesn't like area rugs with tassels on the ends; you will need to fold these edges under the rug to clean it with Roomba. The Accessories: The Roomba comes out of the box with a large, rechargeable battery, a power cube to recharge it overnight, some extra filters for the dust catcher, and one infrared "virtual wall" unit that will draw a line in the air that the Roomba will not cross. Handy to keep it working on one room at a time, or keeping it from going under a really low couch where it might get stuck. The virtual wall units look like this, and they have 3 range settings: 0.3 feet, 4.7 feet and 8+ feet. You can buy extra virtual wall units, extra filters, and a "rapid charger" that charges the battery much faster than the built-in trickle charger. Extra batteries are available, but are rather expensive. Now on to the testing. 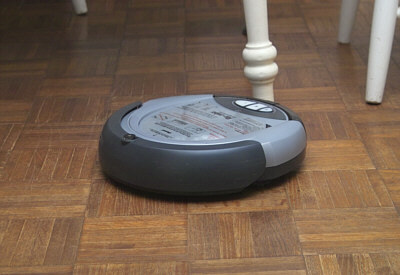 The Adversaries: In this corner, the amazing, the unstoppable, the incredible.... Roomba! In the other corner, we have.... well, whatever it is. The Roomba manual tells you to clean up the room before turning it loose, including picking up shoes, moving power and speaker cords out of the way, and generally not leaving a lot of junk lying around on the floor. I didn't bother, because I wanted to know if it would get stuck easily under normal household conditions. So the dogs and cat had free run of the house while Roomba was cleaning. I popped the battery in, and plunked Roomba down in the middle of a large, cluttered room, turned on the power, and hit the L button. It beeped, and started in an ever widening circular pattern. The unit is fairly loud (maybe 80 db), but it's not nearly as loud as a full sized manual vacuum. As soon as it hit the first solid object, it went off in a straight line. Roomba does a random pattern that it seems to generate on the fly depending on how many objects it hits. Often it will follow a wall, including going around a corner, and around furniture. When it goes under a couch, it often does little circles around the legs, sucking dust the whole time. Roomba even gets into tight places, and doesn't get stuck. It made it in and around the legs of chairs, tables, and just about everything else. When it got to the basement stairs, it stopped, tried a few more times, and then turned around and went the other way. Did Roomba get stuck? Yes. It got stuck a few times. But the picture below gives you an idea of the environment that our Roomba was operating in. 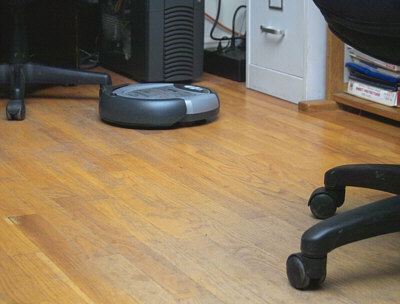 All of the pictures shown in this article were taken while Roomba was cleaning. Once it got caught in what iRobot calls, "the lobster trap", where two objects are just the right distance apart, and Roomba wedges between them. This only happened once with the chair depicted at the right of the picture above, but only when two caster wheels were pointed in opposite directions, at which point the Roomba jammed between them, emitted a sad beep, and shut down. The other two times it got stuck (over two days of testing) was when it caught a small metal chain hanging from a vent on our cast iron stove, and the other was when the edge of a slip cover on a couch got caught in the roller. All of these were easy to remedy. Roomba often went right over speaker cables running under couches, but there were a few times when it almost got hung up on wires. If you can get them out of the way, Roomba will complain less. And what about those pets? Roomba will run right into them. But our pets either ignored Roomba and stood their ground, at which point Roomba bumped gently into them, turned, and went elsewhere, or the pet simply got out of the way and watched Roomba go by. The cat was a little weary of the contraption, and stayed away for the most part. Roomba is quite pet friendly in the sense that it won't swallow your pet, nor will it bruise their ankles. After finishing up a room, Roomba stops and plays a short victory song. A quick inspection of the dust catcher reveals a wad of dirt, dust and hair. This can be easily dumped into the garbage, and you're ready for another room. After 5 to 10 room cleanings, you may need to pull some hair from around the brush roller axles on the underside. This is also quite easy to do. Roomba is not meant to completely replace manual vacuuming, it is meant to drastically reduce the amount of time you have to do this. You will still need to vacuum behind bookcases, etc., not to mention drapes, and other things that Roomba can't get to. The virtual wall units work very well, as does the rapid charger. The built-in trickle charger can take 10 hours to charge the battery fully, but the rapid charger will do the job in less than 2 hours. I was amazed at how much dust and dirt Roomba picked up in a room that appeared relatively clean at the start. It does what it was designed to do, and does it well. I can't say how long Roomba will continue to work properly. It is a fairly complicated device, and I could imagine that it might act up in the future. But reviews I've read suggest that Roomba is built to last. Conclusions The Roomba is a really great first robot for any family. Everyone here who watched it at work was surprised at how well it worked, and talked about getting one. That is one heck of a testimonial. Additional Note: iRobot, the maker of Roomba, has just announced that they have debuted two new Roomba models, the Roomba Pro, and the Roomba Pro Elite, which has a feature that I particularly like; a remote control. Link.